On the surface, I am a young PhD student, studying my absolute favorite subject. I am independent from my parents. I am asexual. I have a super cool secret life. I can speak in English, and French, and I know some American Sign Language. I am a voracious reader, both of fiction and non. I love playing the piano. I am Autistic. And I have a story that wants to be told. At first glance, I pass. I can enter into the neurotypical world and it looks like I’m doing well. It looks like I’m normal, successful, and all-around a good example. I graduated college in two and a half years, with honors, while most people, including my parents thought I would flunk out in a few months. I’m a research scientist, in a wonderful lab, doing what I love to do, and I even get paid for it. I live fully independently, and I can take care of myself, and have good “life skills”: laundry? I’ve been doing my own since I was 4. Cooking? No problem, I am able to make at least one real meal every few days, and can fake the rest with cereal and sandwiches and leftovers. I’ve learned to manage money and can pay all my own bills on time. I’m rules oriented. I’ve never missed a deadline, because I know that it is against the rules. I’m not violent, and don’t have obvious, visible meltdowns. I’ve been trained, meticulously, to be invisible, to not be a burden, to exist without being seen or heard or even acknowledged. Because when you take that second glance, you see that I can’t pass. That I flap and jump up and down and babble incoherently when I’m excited about something. That when I’m tired, or scared, or thinking really hard, I curl up and rock. That I don’t make eye contact, and that I typically communicate in a very one-sided way. That I wear the same thing day after day. I have 8 fleece jackets, because I like the way they feel on my skin, and I wear one every day, because if I don’t the strange textures on my skin make me so uncomfortable that I can’t function. That I jump at the slightest sounds and I always know who is entering the room. That I need to have a routine to function. That I often forget to eat or drink because I’m so absorbed in what I’m doing. That I’m so sensitive to textures that when I do remember to eat, it’s often the same thing over and over again, because I can only tolerate a few foods. The second glance is the one that most people stop: I’m too weird for them, and it’s an effort to be near me or friendly to me, or even to acknowledge that I exist. In our society, “different” translates to “difficult” and difficult situations and people are simply swept under the rug with the philosophy “if we just ignore them, they will go away”. I pass enough to be read as “normal” at first glance, and enough to be made invisible and a nonperson at second glance. But then there’s the third glance, the one that most people never bother to take, but it is the most important one, the one that captivates you, and turns that fleeting glance into a good long look. I am the person I am today, because there are a few people who took that third glance. And they saw a compassionate, excited, quirky, passionate person. They saw someone who is brutally honest, exceptionally aware of her surroundings, keenly observant, meticulous, interesting and fiercely passionate: someone who is worthwhile, and who will be a loyal friend, if you give her the chance. They saw a person, because they took the time to really truly see. I’m hoping that you will take that third glance. Not just at me, but at everyone in your life. I hope that sharing my story, I will help you to see beyond that second glance, and to understand the people you at first brush aside because they are different. I’m lucky because I have words that I can use to express how I think and feel. But these words are new to me and I am still learning how to use them. I am still learning how to take that third glance at myself. So learn to take that third glance, open your eyes and really look at those around you, and in doing so, you will come to know amazing, passionate people. And take that third glance at yourself and discover the wonderful person under your own skin. Because everyone deserves to be seen. thank you for sharing this. I look forward to hearing more. What a wonderful way to put it. Absolutely love this idea and how you’ve expressed it here. I haven’t found many people take the third glance, but the ones who do are life-giving to me. Thanks for reading it. It’s actually something I’ve been thinking about for years – the original title was “the 3-week friendship”, which is about how long it takes for people to register that second glance and run off. And those people who looked beyond and accepted the quirks are the best friends I can hope for. I am new to this topic. My daughter has commented on my weird smile (“Don’t smile like that, it’s weird.”). And just this morning she said, “Either I am crazy or you make weird facial expressions and I think you are mad or angry when you say you are not.” She has always complained about a sound that I make, not realizing it, when I am frustrated, etc. I don’t know if I am slightly autistic or not but I do know I have been diagnosed with social anxiety disorder, slightly bi-polar, and depression. Please let me know what you think. I see a psychiatrist but he has never mentioned this disorder to me. I already feel uncomfortable in social situations but with the blunt honesty of a child coming at me like this, I am thinking I should just try not to interact at all to spare others the trouble of trying to understand me. I found you through outrunning the storms blog. I love your blog & I love all of your posts but this one hits home. That is my son. He looks as if he fits in and then something tells someone he is different. That is where most people stay. If anyone gets past the differences he is the most amazing person. Thank you, I will definitely be back. I found you through Mados. I am impressed with this thoughful and eloquent introduction. You optimism and openess is contagious. Thank you so much for your kind words. It took me more than a year of reading blogs before I began blogging myself. I’m glad you enjoyed it. 🙂 Thank you for stopping by. Great post! Am I allowed to ask what subject you study? Wonderful ideas here…I will be sharing this. Glad to take a third glance. Thanks for the honesty and beautiful writing. I have Asperger’s as does my middle son. Keep up the writing and sharing — you’re helping to heal others. Hi Paul! Thanks for stopping by. 🙂 I appreciate your kind words. Love this article! This puts into words exactly what I’ve tried to explain to some people in my own life. Thanks for writing this. I am always trying to understand exactly how my son feels so I can best help him and since he struggles to communicate sometimes I love hearing whats behind those beautiful blue eyes of his. This is kinda a tangent- but recently I was struggling with the issue of eye contact- my son struggles with it…. so do I pressure him to maintain eye contact more so its easier for him to relate to people and socialize later in life or do I just respect it? I found a site where ADD/Autism/Spectum adults were expressing how they felt about eye contact and how distracting it was to take in facial expressions while they are trying to learn or formulate a thought or deal with a difficult concept. It was so great to hear what was BEHIND the avoidance of eye contact. It made me work on it but more gently and not when he was trying to learn or deal with something. Anyway, the point is that your point of view of what is behind these things is so wonderful and so valuable to help everyone understand. I love my son 100% no matter what, but I love being able to help his teacher understand that he’s not trying to avoid her or be defiant. This information is great to help us encourage everyone to give that third glance:) Its really lack of understanding that causes fear/avoidance and your helping us with that, so thanks !!!! Thank you for sharing this. I am quirky and sometimes miss social cues and married to a man who is quirky. Together we have had 2 beautiful children–one who has autism and one who may (no one can agree). I hope I can nurture them well enough now to deal with the social bias that will face them. I am glad I found your blog. I’ve learned to take that third glance because my son has autism. Your post about words made me stop and catch my breath, not only because I am always wondering how it is for Alex when he is trying to communicate, but also because I so often “lose” words just when I need them most. Thank you for writing & sharing yourself. I am grateful. Love the reason for the name and it is so apropos! I have just discovered this blog via your comment on Flappiness. I am the mother of a wonderful little boy who is on the autism spectrum and would like to thank you for explaining with such eloquence some the things that he is unable to tell me (yet). We neurotypicals so need people like you who can demonstrate that autism is just a word, not a sentence. Congratulations – and if you ever visit Paris to practice your French, let me know…I have lived in this beautiful city for nearly fifteen years and it would be a pleasure to be your guide, should you need one. I empathize with your difficulty in saying no repeatedly to a telemarketer. For me it was not wanting to be offensive. The break through came when a telepest rudely hung up on me while I was politely telling him I didn’t want his product. I finally got mad instead of awkward. Now I often play pranks on them, and though I at times feel offensive I console myself knowing they don’t really care about me anyway. I’m just a potential customer to them. What a lovely way to introduce yourself. 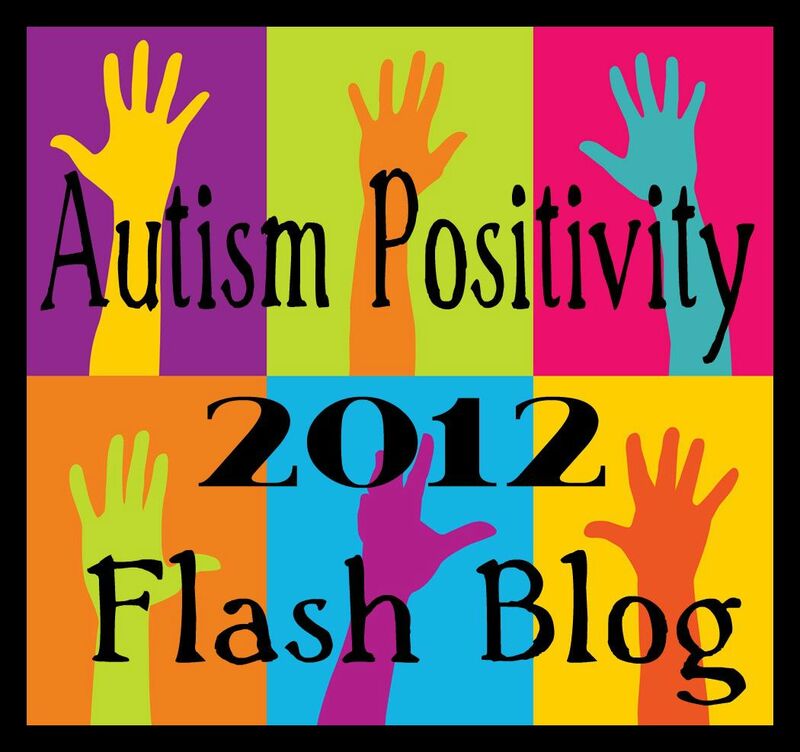 I learned of you only today through the #autismpositivity flash blog. I hope to hang out and read many more of your posts. Thanks for being here. Thanks for this post, it’s great to have some insight too. One of my God-children has been diagnosed with some spectrum of autism. I find it hard to understand and “get in”, but when I do, it’s kind of addictive! So, thank you for opening your heart to us all, for showing us and educating us. Thank you also for pointing at the way to follow you. Keep going, we need more of you around to change the first glance into a 3rd one. Thank you. I just discovered this because you responded to one of my posts 😉 You’re an amazing writer. Here’s to the third glance, the most important one! Hello! I found your site looking for information on autism, since I recently found out that a family friend has a son who is, and wanted to better educate myself. Your blog is beautiful and so full of insights! Although I have known kids with autism in the past, I am ashamed to say that I have always been very ignorant (not knowing how exactly to communicate is one big setback). Through the insights that you have given me, it would be wonderful if I could become a better neighbour, or a better stranger even, for those whom I get the opportunity to meet or pass by. You know, like an equivalent of holding the door open for someone, the small things that we do to keep oneself and others feel comfortable in our daily lives. Thank you so much for coming by and commenting. 🙂 You’re doing a wonderful thing, and I am so glad you’ve found me. Some of the best people to talk to about autism are those of us living it. Though we may not talk in the same way, typing for me is great. I’m always happy to answer any questions people have, to the best of my ability, anyway. So please, I hope you stick around. Also, check out some of the blogs in my blogroll on the right-hand column – there are a number of phenomenal autistic bloggers out there. And feel free to ask me anything you want to know. I’m happy to try to answer (though I may say “I don’t know” – my knowledge extends to my own bounds, after all.) Welcome! What an amazing blog. I have a friend who has a 5 year old with Downs Syndrome and a 3 year old who has just been diagnosed with autism. Your post will certainly help me communicate with them. They are adorable children and I love them so much and would do anything to help them. Please keep up the good work and maybe some day everybody will take that third look. I was so excited yesterday as they both invited me to their birthday party in May so I must be doing something right. God bless you. I hope that is your name for that was the link I answered to. I am grateful for the simple life’s lesson I have learnt here today. Through your blog today, I have learnt a valuable lesson, that as a writer, I feel I should have learnt much much sooner. You are a fantastic writer and I look forward to getting to know you better. By the way, I struggle with French too. In this part of the world, we know at least one or two languages, for me it is Malay, English, Cantonese and a little bit of Arabic. When I was in Canada, I took up French and am now trying to jog my memory. I’m not actually Gretchen – she’s an amazing blogger who blogs at gretchenleary.wordpress.com. I go by “E”. Thank you very much for stopping by here. 🙂 I really appreciate your comment. What an exceptionally well-written post! I am glad that you have people in your life who have taken that third glance. Maybe my son will find others besides his parents and grandparents who will take that time with him someday. Thank you so much for sharing your personal story and struggles, along with Victories. As the mother of a two and a half yr old recent,y diagnosed asd boy I struggle a lot and often worry and get sad at the thought that he won’t be able to take care of h self and make friends in the future. But hearing ur story makes me feel so good, tee is hope, all we need to do is take that third glance cuz like u he is a wonderful human being firs and then an aspie. Thank you so much ! I look forward to more blogs! I’ve had lots of three-week friendships. This post explains things brilliantly. I often don’t know what to say in social situations, which makes me anxious and awkward, and I often don’t say anything or only give very short answers to people’s questions. I think people interpret this as me being very shy, and what makes them realise there’s something different about me is that I don’t get more comfortable with them over time, as they expect a shy person to do, and that’s when they take the second glance. I enjoyed reading this post again. You put things very clearly & I definitely can relate to most of what you are saying. Please keep writing. This is a really helpful account of your experience, and I too thank you for sharing it. I did want to respond to an exchange between you and one of the comments above. I wanted to let you know that for many NT people (including me, but I know it is true for others as well) that choice is also present. That is, focusing on someone’s face and their expression *does* often preclude fully absorbing the content of what they are saying. I am not saying this to try to tell you that you must make the same choice I do in this situation–it sounds like we go automatically to the form of information that is most “natural” to us. But I did think it could be useful for you to know that it doesn’t all come automatically to NT people across both channels–we too are often forced to make a choice but we are less likely to recognize it because our behaviors are shared by the majority and are less conscious. The only part that might be useful would be the part where I (and others) explicitly acknowledge what was missed. Would it be possible or useful for you to be able to say to someone “I’m sorry, I was so focused on your words and what you were saying that I didn’t catch your expression–would that have given me more insight into your feelings about this?” I honestly don’t know if that would be useful, I am sincerely asking you, E.
The other thing I am wondering is whether an aversion to eye contact or a difficulty in reading facial expressions is accompanied by difficulty reading emotional tone in spoken comments. How well do you capture a speaker’s intention through their vocal tone–sarcasm, volume, deadpan monotone vs. singsong/highly expressive tonal variation? And do you know whether your own experience in that realm is similar to other people with autism, or different? Anyway, I hope it is clear that I am not trying to instruct you in how to experience, process or handle your life. I just am thinking about the ways we all handle competing stimuli and trying to understand them better. Hi T, Thanks for your comment. While i do understand what you are saying, I think there is one piece of information missing… When I look at someone’s face, I don’t register their expression or their face or any other information. So for me, it’s not a choice of reading their body language or listening to their words. It’s a choice of listening to their words or gaining absolutely nothing from the interaction. Anyway, would still be very interested in knowing how tone of voice works for you. It is probably my main tool for connection, as I have more than a touch of prosopagnosia. Thanks for all you do! I have recommended your blog to a few people now. A friend who highly involved in the Autism community just shared this today. As a person with ADD who is not that comfortable socially, I really appreciate all of your insight on living with Autism. The Third Glance is an excellent perspective on the importance of not dismissing people so quickly because of their differences. I hope you are doing well and still blogging, E. Thanks so much. Beautiful piece of writing. Thanks for the window on your world. I am relatively new to parenting and my son is “on the Spectrum” in a way that, much as you, he can pass at first glance for neurotypical because that is what “they” teach. I hope for the day when the world recognizes and values ALL kinds of people without insisting on such standardizations. As a 35 year old with ASD, I could never pass for “normal” due to my high anxiety, stimming and inappropriate social gestures and reactions. I think acceptance that acknowledges the barriers of the ASD individual while helping them to learn healthy ways to deescalate when near meltdown, for example and not punish or criminalize the ASD individual after the fact would be a much safer and saner step for all. That acceptance needs to extend beyond school years into working and living situations for those with ASD who cannot tolerate the sensory issues and resulting violent behavior that does arise from sensory overload. I wish this aspect would get more attention by the “experts” and ASD individuals alike.God bless you for being a caring mother to an ASD child. My mom and dad were such strong people. I was googling autistic graduate students. I needed to know that other aspies or aussies have done it. Thanks so much for stopping by and commenting. All the best to you, and I’m honored to have helped in whatever way I did. Thank you for this post. I am a ‘passing on the surface’ autistic who is negotiating this big transition to grad school (hopefully). It’s difficult to find anyone who really understands what it is like to be successful and to have so many difficulties that I need to quietly manage. I really identified with the forgetting to eat thing, though I have historically benefitted from the routine of school life (I wish my real life involved a cafeteria meal twice a day). Hi E, I am doing some research on ASD & languages. Would you mind if I referenced your blog in my thesis? I am captivated by your writing!